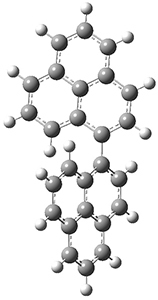 Houk has examined the Diels-Alder reaction involving ethene with benzene 1 and all of its aza-substituted isomers having four or fewer nitrogen atoms 2-11.1 The reactions were computed at M06-2X/6-311+G(d,p). All of the possible Diels-Alder reactions were examined, and they can be classified in terms of whether two new C-C bonds are formed, one new C-C and one new C-N bond are formed, or two new C-N bonds are formed. Representative transition states of these three reaction types are shown in Figure 1, using the reaction of 7 with ethene. Figure 1. 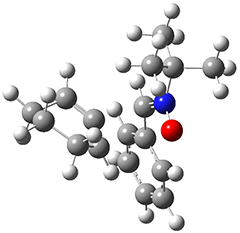 M06-2X/6-311+G(d,p) optimized transition states for the Diels-Alders reactions of 7 with ethene. A number of interesting trends are revealed. For a given type of reaction (as defined above), as more nitrogens are introduced into the ring, the activation energy decreases. Forming two C-C bonds has a lower barrier than forming a C-C and a C-N, which has a lower barrier than forming two C-N bonds. The activation barriers are linearly related to the aromaticity of the ring defined by either NICS(0) or aromatic stabilization energy, with the barrier decreasing with decreasing aromaticity. The barrier is also linearly related to the exothermicity of the reaction. The activation barrier is also linearly related to the distortion energy. With increasing nitrogen substitution, the ring becomes less aromatic, and therefore more readily distorted from planarity to adopt the transition state structure. (1) Yang, Y.-F.; Liang, Y.; Liu, F.; Houk, K. N. "Diels–Alder Reactivities of Benzene, Pyridine, and Di-, Tri-, and Tetrazines: The Roles of Geometrical Distortions and Orbital Interactions," J. Am. Chem. Soc. 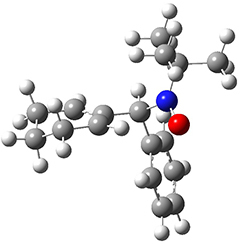 2016, 138, 1660-1667, DOI: 10.1021/jacs.5b12054. 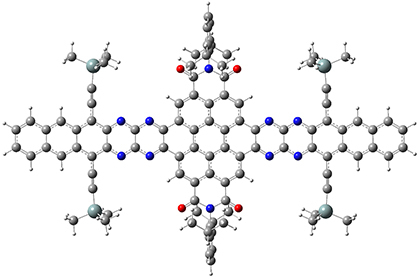 Uchida and co-workers reported on the preparation of biphenalenylidene 1 and its interesting electrocyclization to dihydroperopyrene 2.1 The experimental barrier they find by experiment for the conversion of 1-Z to 1-E is only 4.3 kcal mol-1. Secondly, the photochemical electrocyclization of 2-anti to 1-Z proceeds rapidly, through an (expected) allowed conrotatory pathway. However, the reverse reaction did not occur photochemically, but rather did occur thermally, even though this is formally forbidden by the Woodward-Hoffman rules. To address these issues, they performed a number of computations, with geometries optimized at UB3LYP(BS)/6-31G**. First, CASSCF computations indicated considerable singlet diradical character for 1-Z. 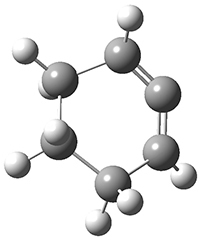 Both 1-Z and 1-E show significant twisting about the central double bond, consistent with the singlet diradical character. 1-Z is 1.8 kcal mol-1 lower in energy than 1-E, and the barrier for rotation interconverting these isomers is computed to be 7.0 kcal mol-1, in reasonable agreement with the experiment. These geometries are shown in Figure 1. Figure 1. 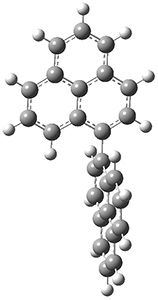 UB3LYP(BS)/6-31G** optimized geometries of 1-Z and 1- and the transition state to interconvert these two isomers. The conrotatory electrocyclization that takes 1-Z into 2-anti has a barrier of 26.0 kcal mol-1 and is exothermic by 3.4 kcal mol-1. The disrotatory process has a higher barrier (34.2 kcal mol-1) and is endothermic by 8.4 kcal mol-1. These transition states and products are shown in Figure 2. So, despite being orbital symmetry forbidden, the conrotatory path is preferred, and this agrees with their experiments. Figure 2. UB3LYP(BS)/6-31G** optimized geometries of 2-anti and 2-syn and the transition states leading to them. The authors argue that the large diradical character of 1 leads to both its low Z→E rotational barrier, and the low barrer for electrocyclization. The Woodward-Hoffmann allowed disrotatory barrier is inhibited by its highly strained geometry, making the conrotatory path the favored route. (1) Uchida, K.; Ito, S.; Nakano, M.; Abe, M.; Kubo, T. "Biphenalenylidene: Isolation and Characterization of the Reactive Intermediate on the Decomposition Pathway of Phenalenyl Radical," J. Am. Chem. Soc. 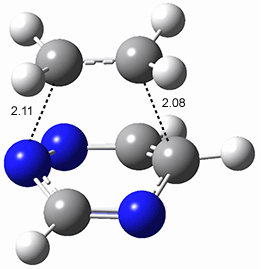 2016, 138, 2399-2410, DOI: 10.1021/jacs.5b13033. 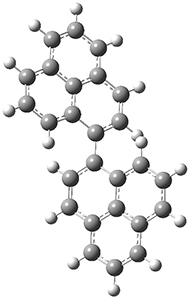 1,2-Cyclohexadiene 1 is a very strained and highly reactive species. 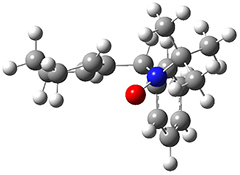 Houk, Garg and co-workers report on its use as the ene component in a cyclization with a 1,3-dipole, namely nitrones.1 For example, 1 reacts with nitrone 2 to give the cycloadducts 3a and 3b in a ratio of 8.9:1. 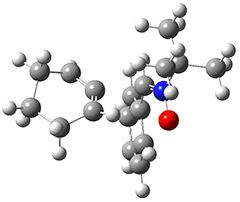 To investigate the mechanism of this reaction, they optimized the structures of all compounds at CPCM(acetonitrile)B3LYP/6-31G(d) and single-point energies were obtained using the B3LYP-D3 functional. The structures of some pertinent critical points are shown in Figure 1. They did locate a concerted transition state (TS1) leading to 3a, with a barrier of 14.5 kcal mol-1, but could not find a concerted TS leading to 3b. (Also, the barriers leading to the other regioisomer are much higher than the ones leading to the observed products.) Rather, they identified a stepwise transition state (TS2) with a barrier of nearly the same energy (14.4 kcal mol-1) that leads to the intermediate (INT), which lies 16.5 kcal mol-1 below reactants. They located two transition states from his intermediate, TS3a and TS3b, leading to the two different products. The barrier to 3a is 1.2 kcal mol-1 lower than the barrier leading to 3b, and this corresponds nicely with the observed diastereoselectivity. Figure 1. 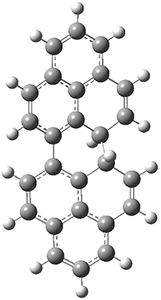 CPCM(acetonitrile)B3LYP/6-31G(d) optimized geometries and CPCM(acetonitrile)B3LYP-D3/6-31G(d) free energies. 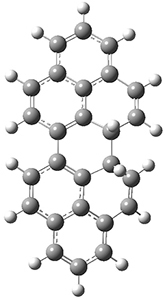 (1) Barber, J. S.; Styduhar, E. D.; Pham, H. V.; McMahon, T. C.; Houk, K. N.; Garg, N. K.
"Nitrone Cycloadditions of 1,2-Cyclohexadiene," J. Am. Chem. Soc. 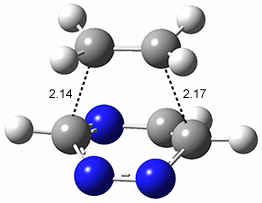 2016, 138, 2512-2515, DOI: 10.1021/jacs.5b13304. 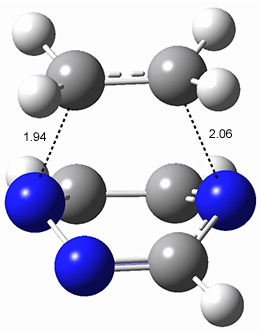 They optimized the geometry of 1 at B3LYP/6-311G*, and its geometry is shown in Figure 1. Even though this compound has quite an extensive π-system, an unrestricted computations collapses to the closed-shell wavefunction. NICS(1)πzz values for the rings are given in Table 1. 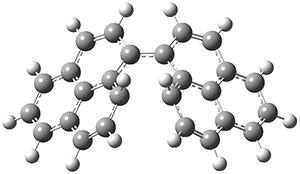 Interestingly, the aromaticity of the coronene moiety is reduced; in fact the central ring (ring A, with rings labeled sequentially working towards either end from the center) has a very small NICS value of only -3.77. Table 1. NICS(1)πzz values for the rings of 1. 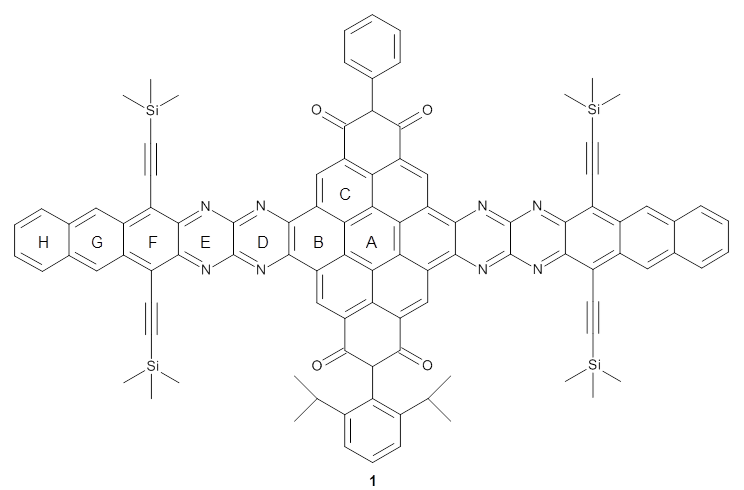 (1) Endres, A. H.; Schaffroth, M.; Paulus, F.; Reiss, H.; Wadepohl, H.; Rominger, F.; Krämer, R.; Bunz, U. H. F. "Coronene-Containing N-Heteroarenes: 13 Rings in a Row," J. Am. Chem. Soc. 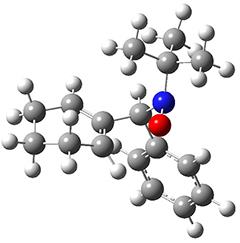 2016, 138, 1792-1795, DOI: 10.1021/jacs.5b12642.